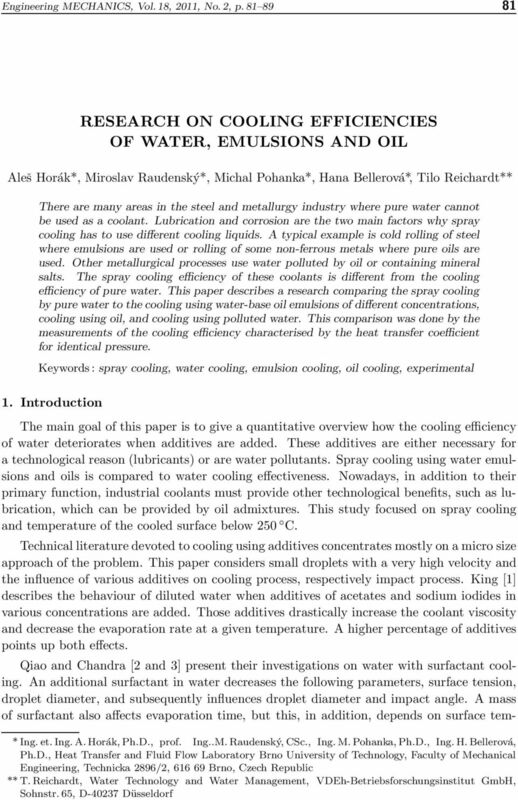 Download "RESEARCH ON COOLING EFFICIENCIES OF WATER, EMULSIONS AND OIL"
8 88 Horák A. et al. 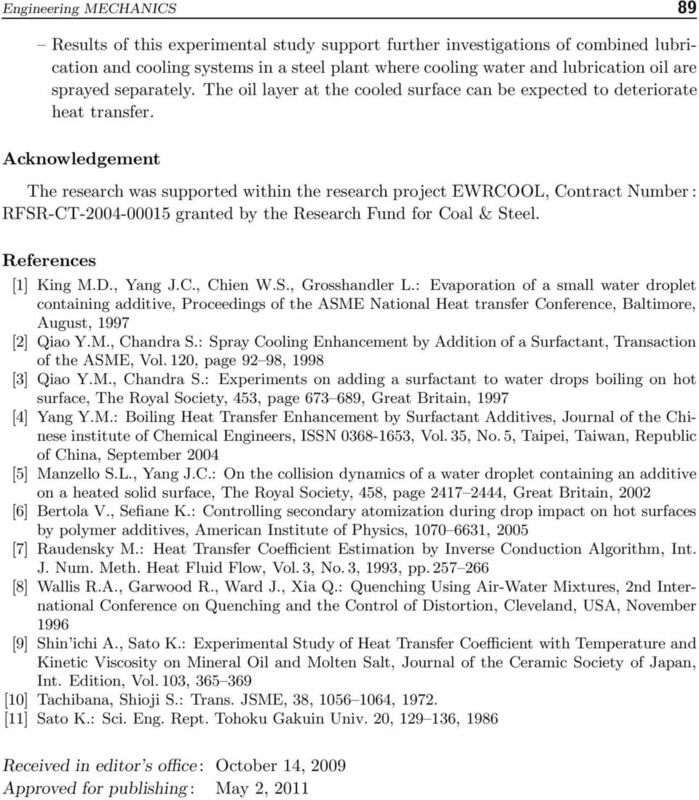 : Research on Cooling Efficiencies of Water, Emulsions and Oil values at high temperature region ( W m 2 K 1 above 500 C). Fan cooling (forced convection) shows slow, but continuous increase of HTC with raising surface temperature. Japanese authors [9, 10 and 11] focus on glass and ceramic cooling applications. Their studies present cooling performances for water and a wide range of oil types (mineral, silicone, spindle, turbine, compressor and machine) in a temperature range of C. Although neither flow rates nor cooling system are described, findings similar to ours are given. At low temperature water performs very well (max. 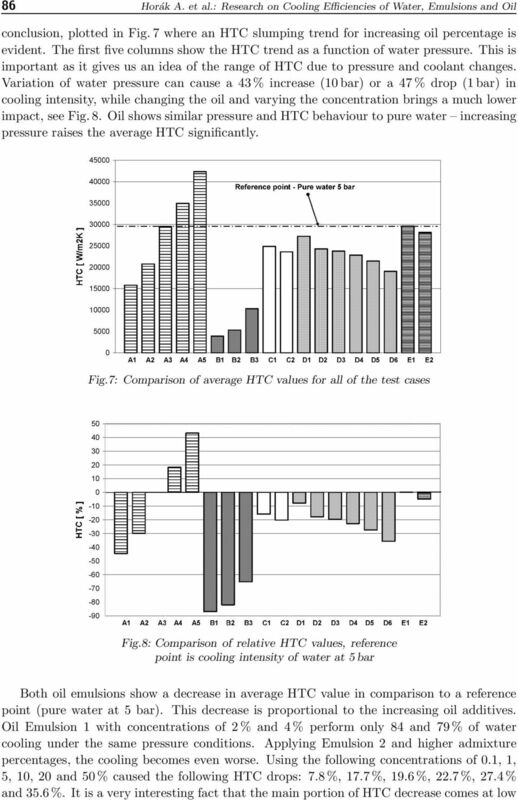 HTC Wm 2 K 1 for 150 C), while at high temperature range less than 500 W m 2 K 1. 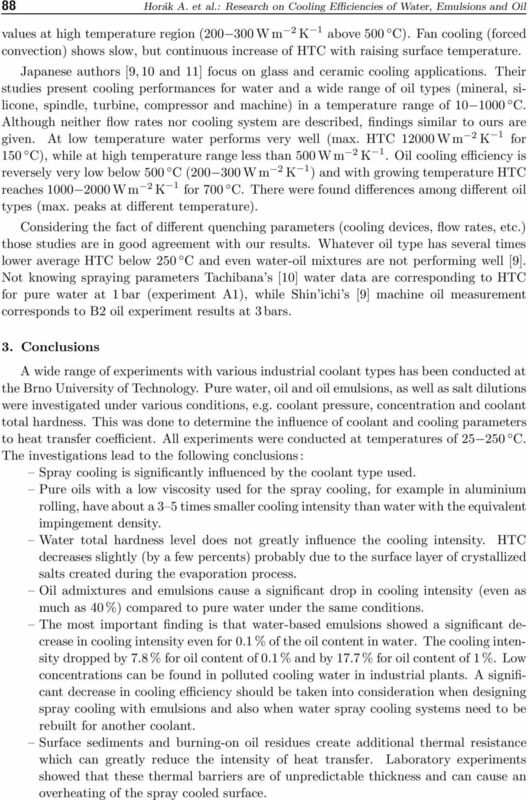 Oil cooling efficiency is reversely very low below 500 C ( W m 2 K 1 ) and with growing temperature HTC reaches W m 2 K 1 for 700 C. There were found differences among different oil types (max. peaks at different temperature). Considering the fact of different quenching parameters (cooling devices, flow rates, etc.) those studies are in good agreement with our results. 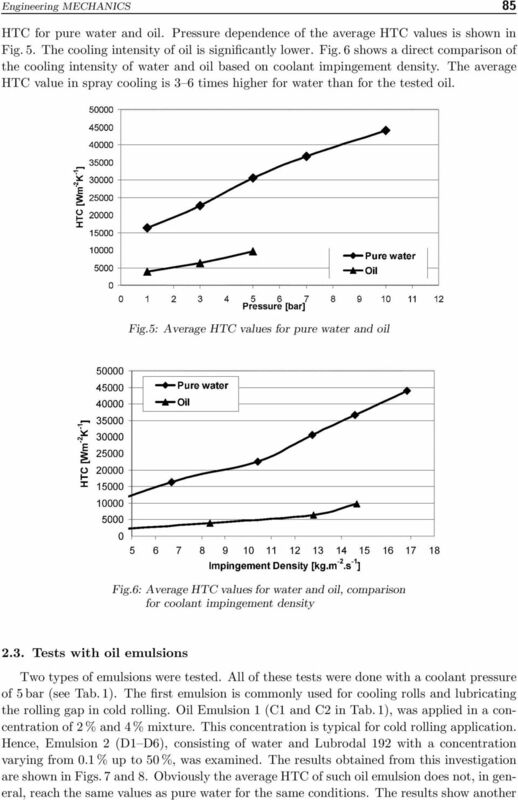 Whatever oil type has several times lower average HTC below 250 C and even water-oil mixtures are not performing well . 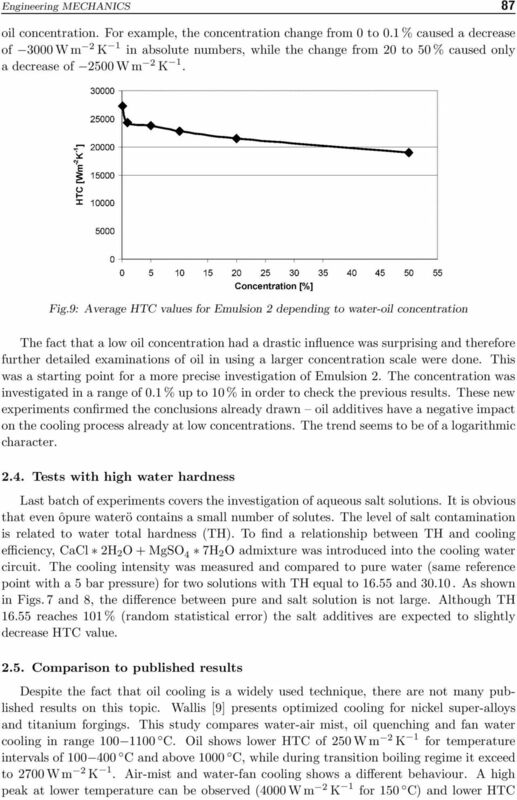 Not knowing spraying parameters Tachibana s  water data are corresponding to HTC for pure water at 1 bar (experiment A1), while Shin ichi s  machine oil measurement corresponds to B2 oil experiment results at 3 bars. 3. Conclusions A wide range of experiments with various industrial coolant types has been conducted at the Brno University of Technology. Pure water, oil and oil emulsions, as well as salt dilutions were investigated under various conditions, e.g. coolant pressure, concentration and coolant total hardness. 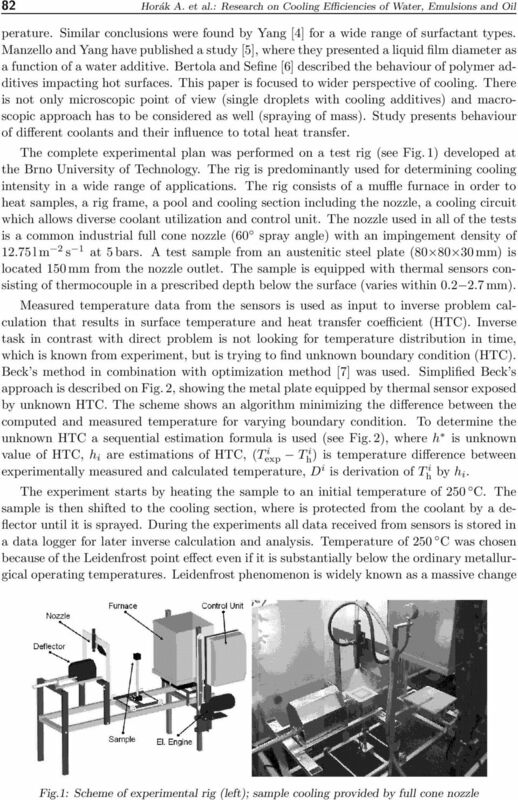 This was done to determine the influence of coolant and cooling parameters to heat transfer coefficient. 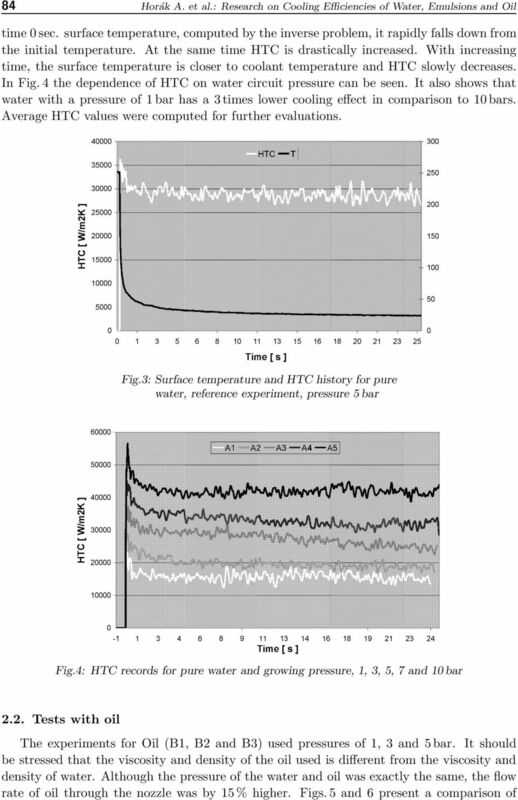 All experiments were conducted at temperatures of C. The investigations lead to the following conclusions : Spray cooling is significantly influenced by the coolant type used. Pure oils with a low viscosity used for the spray cooling, for example in aluminium rolling, have about a 3 5 times smaller cooling intensity than water with the equivalent impingement density. Water total hardness level does not greatly influence the cooling intensity. HTC decreases slightly (by a few percents) probably due to the surface layer of crystallized salts created during the evaporation process. Oil admixtures and emulsions cause a significant drop in cooling intensity (even as much as 40 %) compared to pure water under the same conditions. 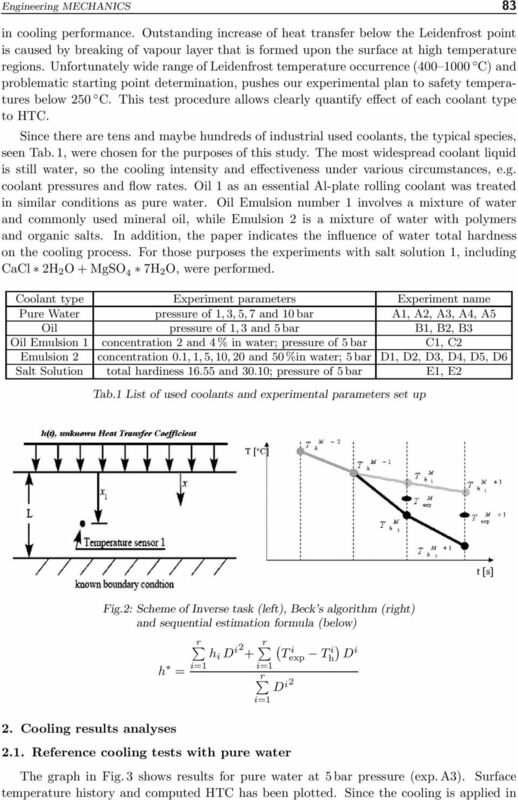 The most important finding is that water-based emulsions showed a significant decrease in cooling intensity even for 0.1 % of the oil content in water. The cooling intensity dropped by 7.8 % for oil content of 0.1 % and by 17.7 % for oil content of 1 %. Low concentrations can be found in polluted cooling water in industrial plants. A significant decrease in cooling efficiency should be taken into consideration when designing spray cooling with emulsions and also when water spray cooling systems need to be rebuilt for another coolant. Surface sediments and burning-on oil residues create additional thermal resistance which can greatly reduce the intensity of heat transfer. Laboratory experiments showed that these thermal barriers are of unpredictable thickness and can cause an overheating of the spray cooled surface. PHYSICAL PROPERTIES: GLASS Physical vs. Chemical Properties The forensic scientist must constantly determine those properties that impart distinguishing characteristics to matter, giving it a unique identity. FIND: Characteristic length and Biot number. Validity of lumped capacitance approximation.